As we get older, out teeth begin to change and are prone to decay. There are many possible reasons for this change in your smile. These reasons can include bruxism (teeth grinding), general decay, cracked fillings,root canals, and many others. 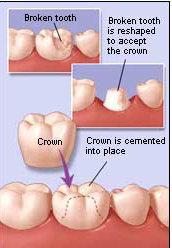 If you tooth is beyond repair with a filling material, a crown may be the best viable option to save the tooth. The reasons for this type of restoration in a badly damaged tooth are durability, cosmetic appearance, and overall support of the chewing function.